Peter Graham is Lecturer in Sustainable Construction in the Department of Building & Construction Economics at RMIT University. He has developed undergraduate courses in environmental studies and management for building professionals and teaches both in Australia and in Singapore. Prior to this he worked in the commercial construction industry in Melbourne as a construction and quality manager and has also worked closely with the building industry in Australia, specializing in developing and implementing waste minimization programmes for companies and industry bodies. His international research includes work with the International Energy Agency, the International Council for Research and Innovation in Building Construction, and aid work in the Pacific. Part 1 Interdependency:how buildings affects nature; Life-cycle thinking:how BEEs think about inderdependency through time; Building Metabolism:how BEEs understands effects on the whole system; Impacts:the effects of current practice; Summary:what do BEEs know now?. 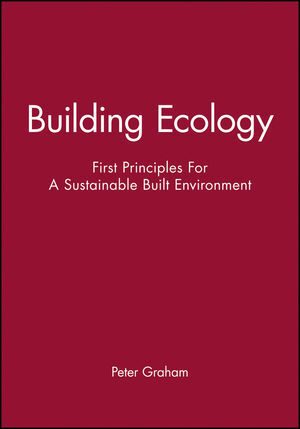 PART II Building Ecological Sustainability; Thermodynamics:underlying physical laws; Change:ecolological sustainability through time; Summary; what do BEEs know now? ;.